Be cool and help cats in need. 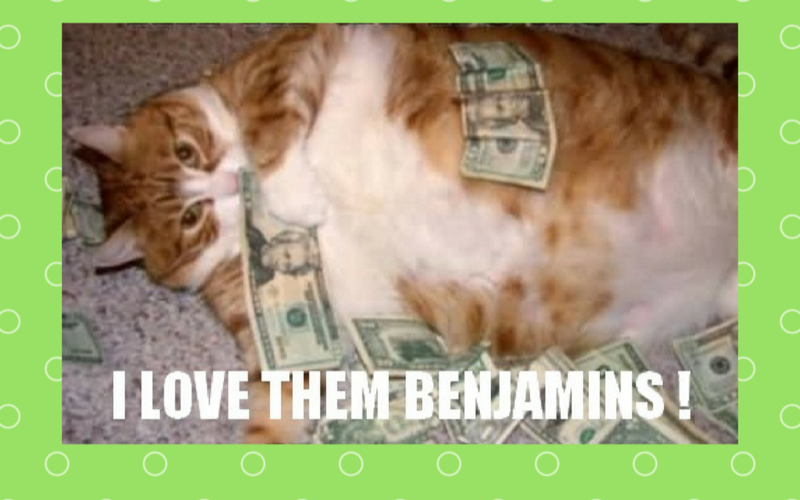 Kitties not only love the benjamins, but rescues need them to continue helping cats in need. That's why I'm raising money for No Kitten Left Behind-MN. Anyone who knows me even a little knows that I LOVE cats. It goes beyond just enjoying watching funny cat videos or wearing a silly shirt with a cat on it. I have made donations of money and my own time as a volunteer, as well as sharing other people's requests for help in order to help the cats that really need it- the cats that are unwanted, forgotten, abused, or born on the streets with little to no chance for a good life. A few years ago, I discovered the cat rescue No Kitten Left Behind-MN. After speaking to the women who ran it, I knew that they cared about the cats just as much as I did, and I wanted to be a part of that. I have been a steady volunteer with them for the last two years. No Kitten Left Behind-MN is foster-based rescue dedicated to helping cats and kittens in need. They provide cats with the necessary medical care and adopt them into caring and life-long homes. No Kitten Left Behind-MN operates entirely on donations from the public. The needs of rescue cats can be great, and no one can do it alone. Will you spare a few dollars for kitties in need?